Every single ad for toothpaste uses the same words, sounds the same, and has dentists recommending them as a top choice for preferred toothpaste. How do you sort through them and get down to the dirty details on clean teeth? The crew at Dental Dorks has taken a good, hard look at the Sensodyne toothpaste. Our hope is to provide an objective review, so you can what makes Sensodyne different than other brands and whether it is right for you. Before we look into the specifics, it’s important to know who we are dealing with, right? No one wants to do business with shady people or second rate companies. We want to know we can trust them to fulfill their promises. That’s why we’re going to talk a little about the company. The Sensodyne brand is manufactured and distributed by Glaxo Smith Kline (GSK), a British pharmaceutical company. 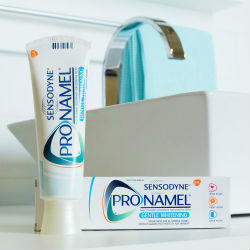 The Sensodyne line is part of its consumer healthcare product line. GSK is constantly innovating and hiring only the best scientists to push innovation to new levels and discover more vaccines and cures. Sensodyne is the line they have produced for sensitive teeth. This is the #1 dentist recommended brand for sensitive teeth on the market today, so you can brush with confidence. The line has been around for over 60 years and they continue to innovate and find new and improved ways to protect your sensitive teeth while still offering protection against cavities and other benefits. Sensodyne’s formula combines stannous fluoride with potassium nitrate The stannous fluoride creates a barrier of protection around sensitive areas of teeth while potassium nitrate soothes the sensitive nerves inside teeth. Exposed nerves are the main reason for toothaches triggered by cold drinks and ice cream, sugary foods and snacks, or bumps is the dentin inside teeth. Stannous fluoride adds an extra coating to teeth, making it harder to reach the nerves in the dentin. It also contains the same fluoride found in most other toothpaste. That fluoride works to fight cavities and maintain healthier teeth. Their other benefits include whitening, gum protection, fresh breath, and fast relief. One thing this line doesn’t use? Sodium lauryl sulfate. That’s the ingredient that makes the foaming bubbles when you brush, so don’t expect this paste to look and feel the same way. They remove this ingredient because it’s the main component of other kinds of toothpaste that irritate sensitive teeth and gums. It is important to brush regularly because the benefits of using Sensodyne take about 2 weeks to kick in fully. It is recommended that you brush your teeth twice a day using a soft-bristled electric toothbrush. Sensodyne has a wide range of products for any dental needs. Let’s take a look into some of their features, what they’re made to do, and how they stack up to other options. If your teeth are suffering and you’ve spent too many days wincing in pain when trying to do simple things like drink from a glass that has ice, then this may be your best option. Rapid Relief was designed to reduce pain from sensitive teeth in a little as 3 days of regular brushing. On top of whitening teeth by removing stains, freshening breath, and fighting cavities, it also features lasting protection for sensitive teeth. Once your enamel is worn away, it can’t grow back, but with this fluoride barrier, it doesn’t have to hurt all the time. Once you’ve used toe rapid relief to combat the daily pains, you can swap to another formula in their lineup. Staying within the Sensodyne brand ensures that you don’t lose the protective barrier for sensitive teeth. The deep clean line is specially formulated to deep clean teeth without triggering sensitivity issues. It still offers the benefits associated with the potassium nitrate and fluoride, but this formula goes deep. It works by cleaning the tooth’s surface and managing to get between teeth to assist dental floss with cleaning those hard to reach areas. IT also works inside the teeth, soothing over-stimulated nerves. Pronamel kinds of toothpaste are designed with longevity in mind. When a tooth loses its enamel, it can’t regain it. Pronamel toothpaste works to prevent enamel from decaying or eroding. This ensures that you keep your enamel for life. This toothpaste safeguards enamel from acid attacks found in coffee, food, and soda. On top of all the benefits of normal toothpaste, it also has a special formula that allows minerals to penetrate the enamel surface, boosting your calcium levels while preventing unwanted materials from following into the enamel. It is also a much less abrasive toothpaste, so it won’t cause enamel erosion form daily brushing. For those of you who are concerned that your pearly whites are looking more like opals thanks to stains and build up, the Extra Whitening formula may become your best friend. Sensodyne Extra Whitening is the #1 selling toothpaste for sensitive teeth in the US, so you know that it is safe and effective. Along with the usual benefits, this toothpaste removes deeper stains for a white smile while still calming the nerves inside sensitive teeth so your pain won’t come back to haunt you. With so many toothpaste products on the market, it can be really difficult to know what to choose. Even if you break it down to the Sensodyne brand, you still face quite a few decisions to make. If you have sensitive teeth, then start with Rapid Relief and when you start noticing that your sensitivity has decreased, swap to one of their other formulas to get the extra benefits without compromising the protection for sensitive teeth. As always, brushing regularly doesn’t mean that you shouldn’t schedule regular checkups with your dentist.